July 4th Party Supplies To Get Your Independence Day Party Off To A Booming Start! Get Ready For Fireworks, Fun And Games With Your Friends And Family. The 4th of July is a big picnic/BBQ day in my house and we always celebrate American Independence Day with lots of red, white and blue. We use the red, white, and blue theme in our party decorations, our party food and our game ideas! Let me tell you about some of the wonderfully unique party favor ideas I am thinking about for this year's 4th of July party and I'll also tell you where you can buy them at a discount! Party Favors are always a big hit at a party but 4th of July party favors are the most fun of them all. Here are a few of my favorite favor ideas for Independence Day, there are some very cute Patriotic Rubber Duckies that glow in the dark, some Patriotic Flag Fans to keep your guests cool and some Patriotic Temporary Tattoos for your guests to decorate themselves with. Every party needs some games, even a 4th of July party! I've found some fun games with a red, white and blue design that will keep your guests playing and having fun all day long. There are also some great printable party games for extra fun during the day.The games pictured on this page are the Patriotic Bean Bag Toss, the Fireworks Ring Toss Game, and the ever popular Beach Ball. The ball is great for a game of Volley Ball and I'm sure that will be quite entertaining. The pinata is a great party game any time of the year, but this star shaped pinata decorated with red, white and blue is really great. Fill it up with red, white and blue goodies and treats, perhaps throw in some of the 4th of July mints, and you are good to go. Hang the pintata, secure the area around it to keep it very safe and have fun playing the pinata game! Here's some election mints to fill your Patriotic pinata with! Printable party games are perfect for your 4th of July celebration. You will find games like this 4th of July Games Pack! 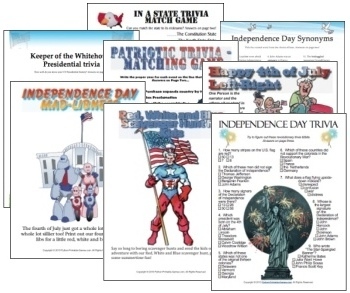 that has games like: Independence Day Trivia, Happy 4th of July Left-Right Game, Independence Day Mad-Libness, In A State Trivia, Independence Day Synonyms, Patriotic Match Games, and more. The party favors and games on this page are fun stuff at any party, but there are so many more great ideas and I've pictured a few of them here. I don't know about you, but I LOVE BUBBLES! (and so does my 19 month old grandson) That means bubbles are now a part of any get together we have. Then there are some really cool red, white and blue sunglasses that your party guests will appreciate very much. There are also some Super Cool Stars and Stripes Glider Planes that everyone will want to play with! These July 4th Party Supplies need some cake and cupcake decorating ideas. Find July 4th edible images for your cupcakes and cakes on eBay. I found some Patriotic costumes that are perfect for your 4th of July celebrations! There's Uncle Sam, an American Patriot, Miss Libery, The Statue of Liberty, Aunt Samantha, and lots of fun costumes for kids and adults. So if you are planning some dress up fun at your July 4th party, here are the patriotic costumes you will need. "Darth Vader 11"" Pull-String Pinata"
"Galaxy Wars Personalized Photo Banner Standard 18"" x 61"""